The mobile wet separators of the NA series are available in three versions. 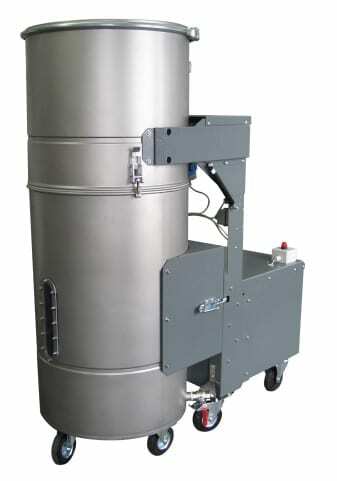 As a dust extractor for connection to processing machines with nozzle Ø up to 100 mm, as a suction cleaner for hose Ø 50 mm or as a pre-separator for connection to an existing suction system. The range of application lies above all in the extraction of sticky materials and in work processes with strong flying sparks. All variants are also available in ATEX design for the extraction of flammable, explosive and dry dust in Zone 22. The units then comply with the directives 94/9 ATEX and BG Chemie 036. Due to their compact design and low space requirement, the new NA wet separators can be used for a wide range of applications which previously could only be solved with considerably larger stationary wet separators. The mobile units require little floor space and are equipped with the ESTA-typical tiltable upper part, which allows easy access to the interior of the unit. Additional equipment such as automatic water level control, etc. offer further ease of use.